Probably early 1960s Looks like its missing the bottom money tray.Should be a good player. Missing “something” in the left rear of the chassis. Have the tray, no power cord. More than likely the plugs are for a "Candle" which may have resided on the top of the slot machine to light up on a Jackpot as well as for a White light to summon a change person! 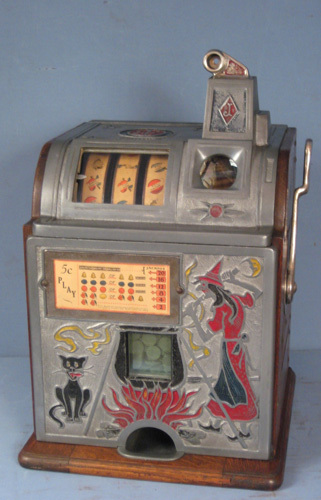 Also to interconnect with the mechansim for a micro switch that would have either been up by the vertical payfingers or on the top of the payout slide housing to trigger the Jackpot light in the "Candle" when the Jackpot was hit! And also for the fluorescent lighting on the door, Etc. 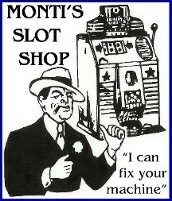 All of these items were probably removed when the slot machine was pulled off of location, either a casino or a bar as the route operator or casino slot department would have kept them for spare parts! Thanks. The unit is missing the power cord. Four pin round connector. Any suggestions where to find one. the fluorescent light assembly which would require a ballast, a starter, Etc. for each fluorescent lighting tube used! the candle, if desired and all its components, bulbs, sockets, wiring, Etc. the micro switch assembly to signal when a jackpot occurs and send voltage to the candle! It may have originally had a Jackpot bell as well! Then, and only then after you establish where voltage is necessary would you be wanting to apply power with a power cord assembly! Possibly more detailed photos of the mechanism, Etc. would help to determine what you have or don't have!